Broadway In Chicago announced the Chicago premiere of the critically acclaimed and 10-time Tony Award-winning production THE BAND'S VISIT for a limited two-week engagement at Cadillac Palace Theatre (151 W. Randolph) from Sept. 10-22, 2019. After a mix-up at the border, an Egyptian Police Band is sent to a remote village in the middle of the Israeli desert. With no bus until morning and no hotel in sight, these unlikely travelers are taken in by the locals. Under the spell of the desert sky, their lives become intertwined in the most unexpected ways. THE BAND'S VISIT celebrates the deeply human ways music, longing and laughter can connect us all. THE BAND'S VISIT opened at Broadway's Ethel Barrymore Theatre (243 West 47th Street) on Thursday, November 9, 2017, featuring music and lyrics by Tony and Drama Desk Award winner David Yazbek, and a book by Tony Award, NY Drama Critics Circle, Lortel and Outer Critics Circle awards winner Itamar Moses. It is based on the screenplay by Eran Kolirin, and is directed by Tony, Drama Desk, Lortel & Obie Award winner David Cromer. The creative team also includes Patrick McCollum (Choreography), Scott Pask (Set Design), Sarah Laux (Costume Design), Tony Award winner Tyler Micoleau (Lighting Design), Tony Award winner Kai Harada (Sound Design), Maya Ciarrocchi (Projection Design), Charles G. LaPointe (Hair Designer), Tony Award winner Jamshied Sharifi (Orchestrations), Andrea Grody (Music Supervisor, Music Director & Additional Arrangements) and Dean Sharenow (Music Supervisor & Music Coordinator). THE BAND'S VISIT won 10 2018 Tony Awards, including Best Musical, Best Original Score (David Yazbek), Best Book (Itamar Moses), Lead Actress (Katrina Lenk), Lead Actor (Tony Shalhoub), Featured Actor (Ari'el Stachel), Lighting Design (Tyler Micoleau), Sound Design (Kai Harada), Orchestrations (Jamshied Sharifi) and Director (David Cromer); the Drama League Award for Outstanding Production of a Broadway or Off-Broadway Musical; the New York Drama Critics' Circle Award for Best Musical; two Lucille Lortel Awards, for Outstanding Musical and Outstanding Lead Actress in a Musical (Katrina Lenk); two Outer Critics Circle Awards, for Outstanding New Off-Broadway Musical and Outstanding Score (David Yazbek); two Obie Awards, for Musical Theater (David Yazbek & Itamar Moses), and Directing (David Cromer); three Drama Desk Awards, for Outstanding Director of a Musical (David Cromer), Outstanding Music (David Yazbek) and Outstanding Lyrics (David Yazbek); The Joe A. Callaway Award for outstanding direction (David Cromer); The Dramatists Guild's 2017 Frederick Loewe Award for Dramatic Composition for David Yazbek's score; and Theatre World Award's Dorothy Louden Award for Theatre Excellence (Katrina Lenk). THE BAND'S VISIT has broken the all-time box office record at Broadway's Barrymore Theatre twice. 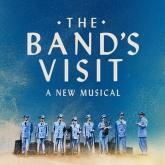 THE BAND'S VISIT is produced on Broadway by Orin Wolf, StylesFour Productions, Evamere Entertainment, Atlantic Theater Company, David F. Schwartz, Barbara Broccoli, Frederick Zollo, Groveâ€¢REG, Lassen Blume Baldwin, Thomas Steven Perakos, Marc Platt, The Shubert Organization, The Baruch/Routh/Frankel/Viertel Group, Robert Cole, DeRoy-Carr-Klausner, Federman-Moellenberg, FilmNation Entertainment, Roy Furman, FVSL Theatricals, Hendel-Karmazin, HoriPro Inc., IPN, JAM Theatricals, The John Gore Organization, Koenigsberg-Krauss, David Mirvish, James L. Nederlander, Al Nocciolino, Once Upon A Time Productions, Susan Rose and Paul Shiverick. The Executive Producer for THE BAND'S VISIT is Allan Williams. THE BAND'S VISIT world premiere opened to critical acclaim at the Atlantic Theater Company on December 8, 2016, where the sold-out, limited engagement extended twice, playing its final performance on Sunday, January 8, 2017.